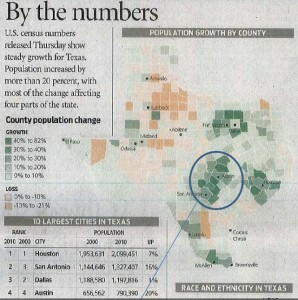 Central Texas is one of the fastest growing and most dynamic regions in all of Texas. The region includes both Austin and San Antonio which form two bookends of an exceptional business corridor with a growing population of over 3 million people within a 60 mile radius. Each of these two cities was rated by Forbes Magazines in 2011 as among the top cities in the United States for business. Austin and San Antonio ranked as America’s Next Boomtowns (See “Articles on Growth“). San Antonio also was listed as having the best jobs outlook in the entire United States. These are compelling reports, and it translates into significant growth on the horizon for the area between these two dynamic and nationally recognized markets. What makes the Austin-San Antonio corridor so compelling? Austin features high tech, education, and government, while San Antonio is underpinned by medical, military, aviation, auto manufacuring, and tourism. It now also is experiencing a major oil and gas boom just south of San Antonio. Midway between Austin and San Antonio are three historic and growing communities: San Marcos, Seguin, and New Braunfels. These cities boast international notoriety for their world-class tourist attractions, industry, and location. They each have quick access to Austin and San Antonio less than 45 minutes away in either direction and over 3 million people within a 60 mile radius. 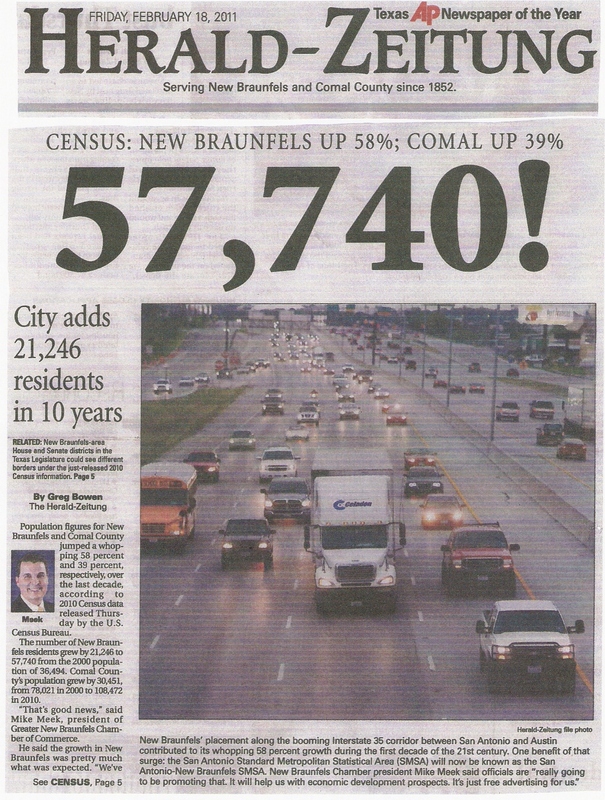 As the below chart demonstrates, New Braunfels grew at a blistering pace over the past decade. If you are looking for the ideal spot to invest, this region offers the potential for both immediate and long-term appreciation in real estate values. It presents a unique opportunity to reach two of the nation’s hottest markets, and it is an excellent area to consider expanding your business. For further information, contact Ted Omohundro at (830) 708-7710. Forbes has just released its latest report of America’s Next Boomtowns. 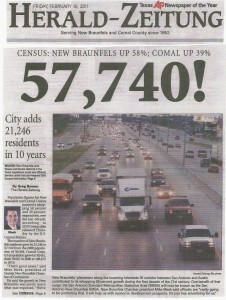 It placed Austin in the #1 slot and it placed San Antonio in the #4 spot. What does that mean for this area that is strategically located right between both cities? Clearly, it means there will be major activity in this growth corridor. The future is very bright indeed for this area, making it the sweet spot for Texas growth. “Our look at America’s Best Places for Business showcases the stark contrast between Texas—with its low-cost, pro-business regulatory environment (5 cities among the top 25, led by Austin at No. 7)—and overregulated and wildly expensive California (home to 8 cities that rank in the bottom 25, including No. 200 Merced). Texas was one of the last economies to succumb to the recession and one of the first to bounce back, while California is limping along with an unemployment rate of 11.7% (only Nevada’s is worse). For further articles on the area, check out Texas Communities on the main menu of this site and select “Articles” from the drop down menu. Check out this video of Fox News interviewing San Antonio Mayor Julian Castro about the City’s designation as the top performing economy in the United States in 2011.